I’ve been quite ill these past few weeks, and have only just begun feeling a bit like my old self. So to celebrate, I baked up one of my favourite treats, a recipe I’ve wanted to share since the first time I tried it out of the Hummingbird Bakery Cookbook over two years ago. This recipe combines three of my favourite things: chocolate brownies, baked cheesecake, and raspberries. When I first tried a slice of this from the London store many, many years ago (gosh… it’s been so long since uni), I feel completely in love with it. So when my friend, Jimmy, came back from a holiday in the States with a copy of the Hummbingbird Bakery Cookbook for me, it was the first thing I searched for. And lo, there it was! It’s a simple enough recipe to whip up on a night in, assuming you have all the ingredients on hand. So turn on the telly, watch a couple episodes of The Voice, and bake away! Yes, that’s exactly what I did on Saturday night after attending a friend’s wedding with my boyfriend, and I can’t think of a better way to spend a night in. Melt the chocolate over a bain-marie, and while waiting for that, beat the butter and sugar in a large bowl. Beat the eggs in, one at a time, then incorporate the flour and mix on medium speed. Pour the chocolate in and gradually increase speed to get it all combined. Pour the batter into the prepared tin and set aside. When ready to serve, prepare the raspberry cream. First chill your mixing bowl and whisk attachment in the freezer for 5 minutes (I can’t remember where I learned this trick, but have always done it for whisking cream). Whisk the cream and sugar until stiff peaks form, then whisk in the raspberries. 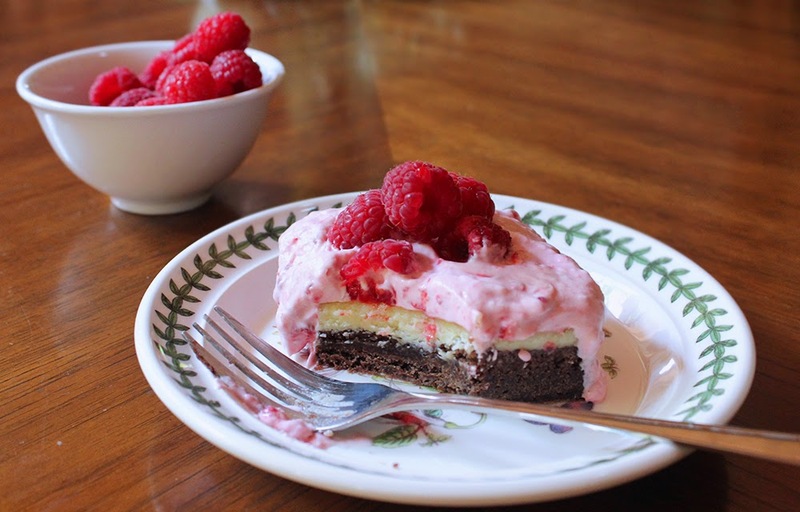 Spread or dollop the raspberry cream over the brownie cheesecake, and serve with fresh raspberries!